DESCRIPTION:The Main Rotor Spindle Removal tool is used to remove and install the main rotor spindle assembly safely and effectively, eliminating potential damage to main rotor hub components. 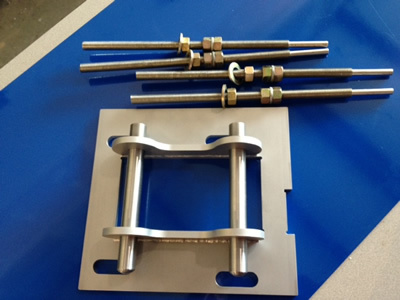 It s a rectangular piece on machined aluminum with a custom-fit cut-out to fit over the spindle assembly. 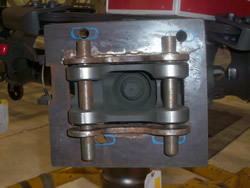 The tool has a safety feature that catches the spindle as it is being removed, eliminating risk to deck damage and personnel injury. 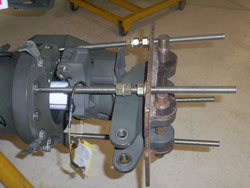 FUNCTION:The Main Rotor Spindle Removal tool is designed to provide a controlled removal procedure of the main rotor spindle. 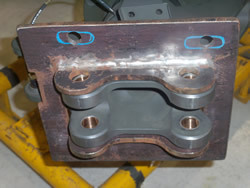 It provides the maintainer the ability to catch the spindle as it is being removed using a safety catch feature on the tool. 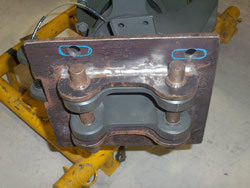 The tool also is designed to apply greater shear force in removing stuck spindles. 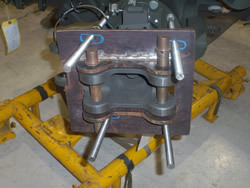 No locally made tool is available in the IETM. 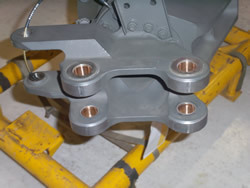 The tool has a precise fit allowing the maintainer to fit the tool on the hub assembly without risk of damage. 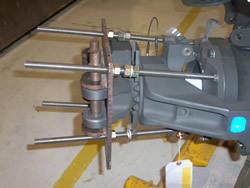 A simple Mac-thread assembly on the tool safely pulls the spindle out from the hub assembly.